With all reviews, I try to go into it without any preconceived expectations. That was a little harder to do at Corked, given the excellent past experiences I’ve had eating and drinking here. 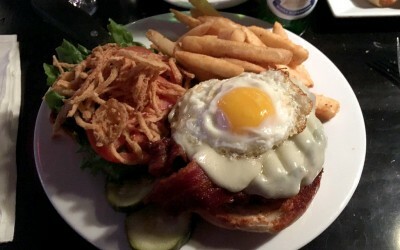 Admittedly, I was completely banking on this burger being good. If you haven’t had a chance to try Corked yet, you really should soon. 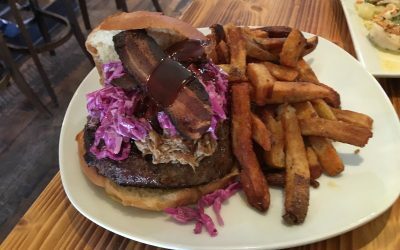 It’s one of the Lehigh Valley’s few all-around excellent restaurants. 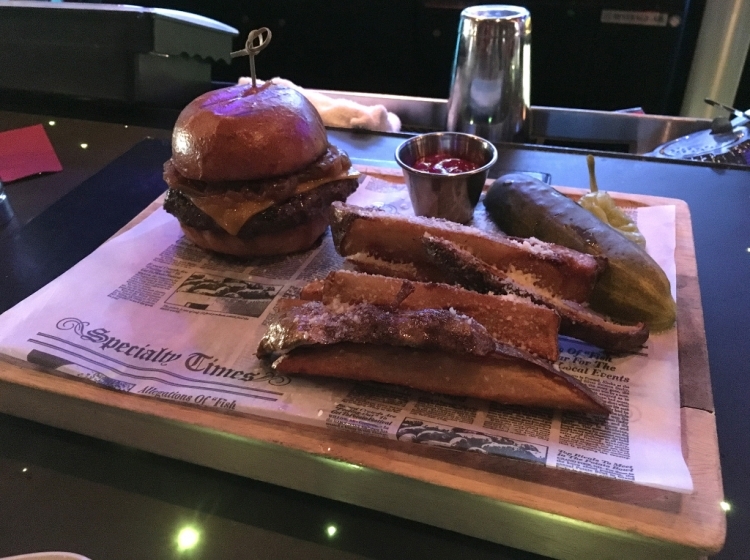 From the amazing menu and bar, to the decor and service, it doesn’t get much better than the experience Chef Joe Grisafi and his team have built. 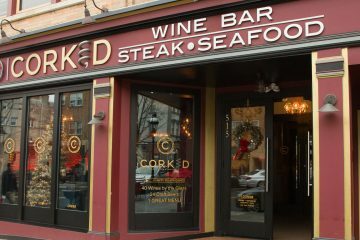 Corked’s menu is interesting and focused. 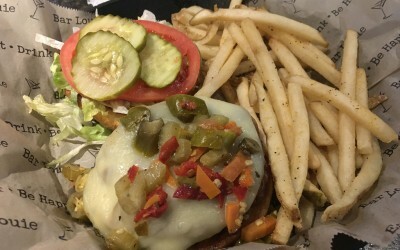 A good example of that is the fact they serve one burger option, and don’t complicate things with several burgers with ridiculous toppings that make it harder to choose and lessen the focus of the cooks creating something that should always be simple and delicious. One burger. Simple toppings. Cooked perfectly. 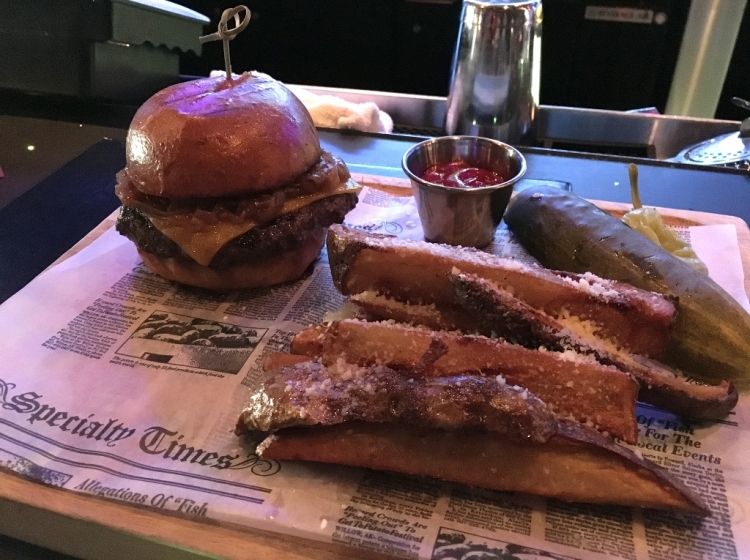 Corked’s burger is named the 8oz Truffle Burger, and comes served with Corked-made Truffle Mayo, Cheddar, Caramelized Onions, Ketchup, and Truffle Parmesan Fries. 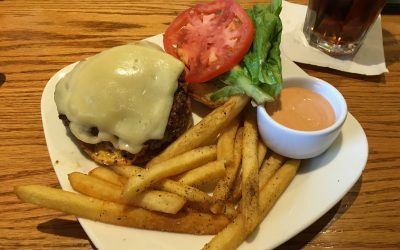 You’d think with truffle appearing in the burger AND the fries, it’s possible that could become the dominant flavor, overpowering the burger. However, that’s not the case at all. Quite the opposite really. The use of truffle is perfect, only acting as a beautiful background to the rest of the ingredients. The star of the show is the beef itself. Although just slightly undercooked for medium, the crispy, salty char on the outside provides so much flavor that I would’ve been happy eating it all by itself on a plate with a fork and a knife. It’s steak-worthy. 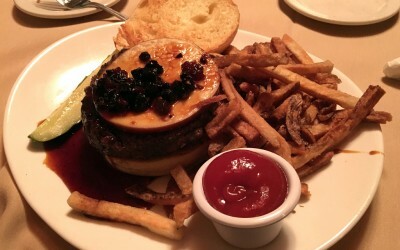 Then, Corked does a great job taking that amazing burger and making it sing with the toppings. 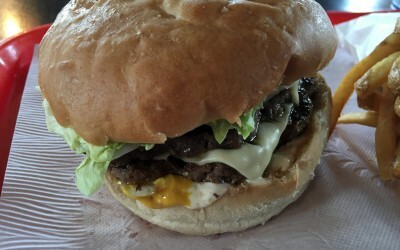 The caramelized onion, cheddar, truffle mayo all work together in the kind of harmony that you rarely find in a burger. As you can imagine, it’s a little on the greasy side. 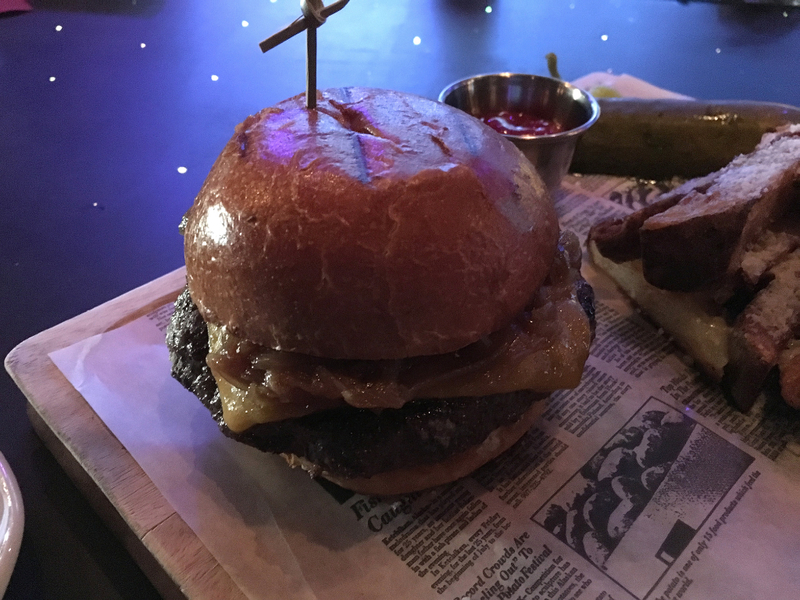 But hey, this is a burger, it’s supposed to be a little messy. 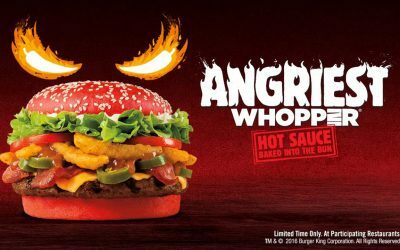 The bun, which is nicely toasted to a golden brown with crispy edges, is slightly smaller than the burger patty. Although the bread itself is a little dry and could’ve been buttered a little more, it’s more than an adequate accompaniment. 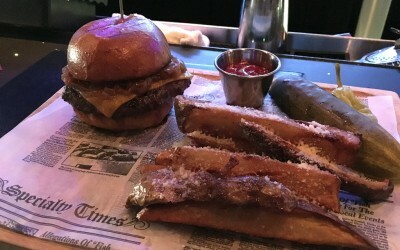 On the side are thick-cut steak fries. 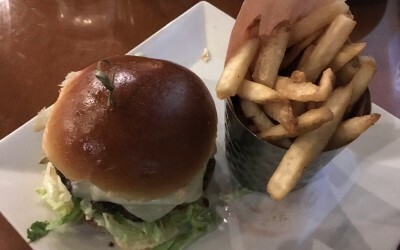 If you’re a regular reader of this blog, you’ve probably seen my aversion to large cut fries. They tend to be mushy and mealy, and usually get soft too quickly because of the amount of steam escaping through the extra potato underneath the previously crispy crust. 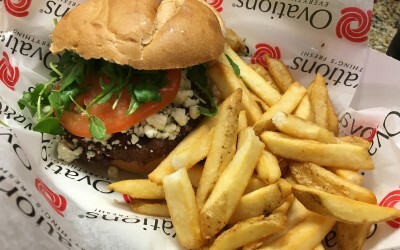 None of this is a problem with Corked’s steak fries. As a matter of fact, they’re probably the best, crispiest, most delicious steak fry I’ve ever had anywhere. The shaved parmesan on top adds an extra subtle saltiness, working symbiotically with the hint of truffle oil. While it’s not something we factor into our reviews, presentation is also worthy of note here. Clearly Corked takes pride in their burger, and instead of throwing it on a boring plate next to a random pile of fries, it’s presented on a beautiful wooden cutting board lined with newspaper print, next to a neat stack of steak fries. I’ve always appreciated that kind of respect a restaurant has for it’s craft. 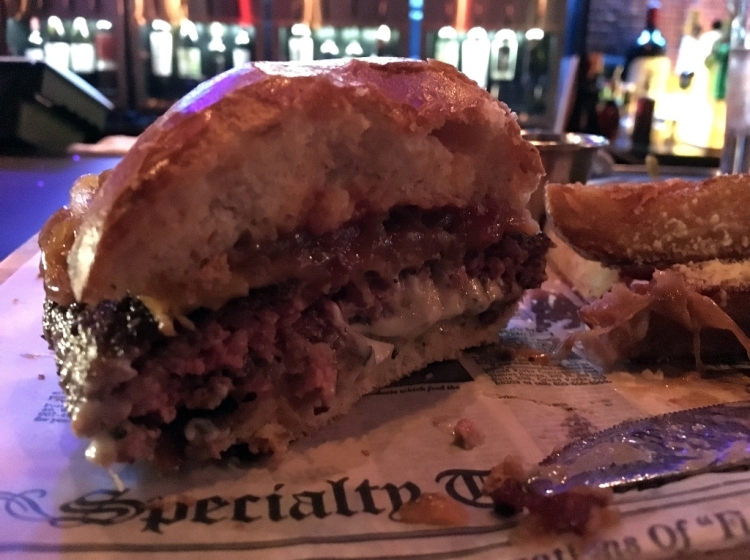 Corked’s 8oz Truffle Burger is a very savory burger that only could have been made better with just a bit of acid to cut through all that fat. Possibly a razor thing house pickle, or a tad extra tangy ketchup to brighten things up just slightly. In my humble opinion, it approaches perfection, and deserves a place amongst the best burgers in the Lehigh Valley. 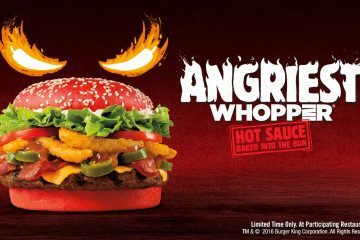 My only serious regret is not trying this burger sooner.